g anatomy separately from physiology for clarity and improved comprehension. Each anatomy chapter has a corresponding physiology chapter, complete with illustrations, charts, and boxes to promote understanding. 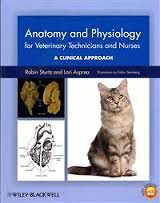 Written specifically for veterinary technicians and nurses, the book applies anatomy and physiology to clinical practice, with case examples demonstrating clinical relevance. The figures from the book, additional questions and answers, labeling quizzes, teaching PowerPoints, and a dissection video are available online at www.wiley.com/go/sturtz. This introduction to body system analysis of normal structure and function is a must-have resource for students of veterinary technology and nursing, as well as a useful quick review for the busy professional.